Here are the first four of eight images (plus one wide shot) of the new Patterson memorial at the junction of Northumberland and Beverly Streets. As the text on the board describes, Patterson went from Ireland to Kenya, where he killed several lions after months of hunting. He wrote an account of the hunt ‘The Man-Eaters of Tsavo’ which has inspired three movies; the lions, named The Ghost and The Darkness, were both over nine feet in length. 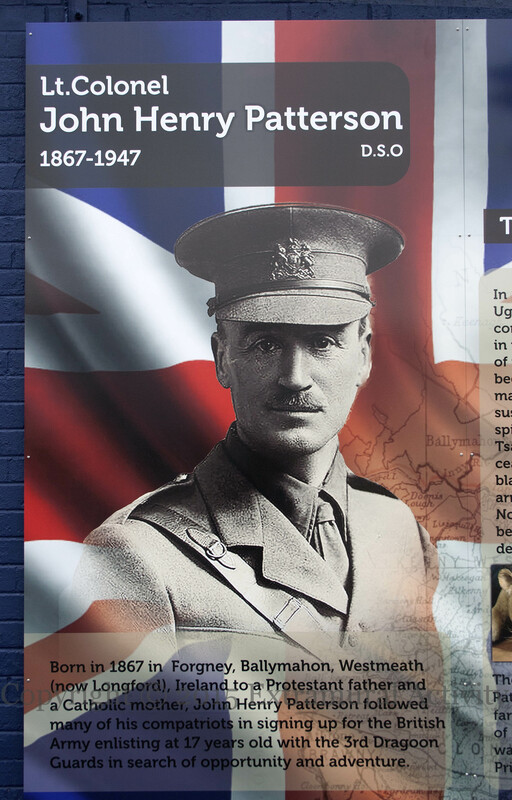 Back in Ireland he commanded a battalion of the UVF and was involved in the Larne gun-running of 1914: Operation Lion. text: X02614 X02615 X02616 X02617 X02623 John Henry Patterson DSO 1867-1947. Born in 1867 in Forgney, Ballymahon, Westmeath (now Longford), Ireland to a Protestant father and a Catholic mother, John Henry Patterson followed many of his compatriots in signing up for the British Army enlisting at 17 years old with the 3rd Dragoon Guards in search of opportunity and adventure. In 1898, John Patterson was commissioned by the Uganda Railway committee in London to oversee the construction of a railway bridge of the Tsavo River in present-day Kenya. He arrived at the site in March of that year and almost immediately lion attacks began to take place on the workforce, resulting in as many as 140 deaths. The superstitious workers suspected that the attacks were carried out by evil spirits summoned to punish those who worked at Tsavo. Work on the bridge ceased and the workers blamed Patterson for the arrival of this terror. 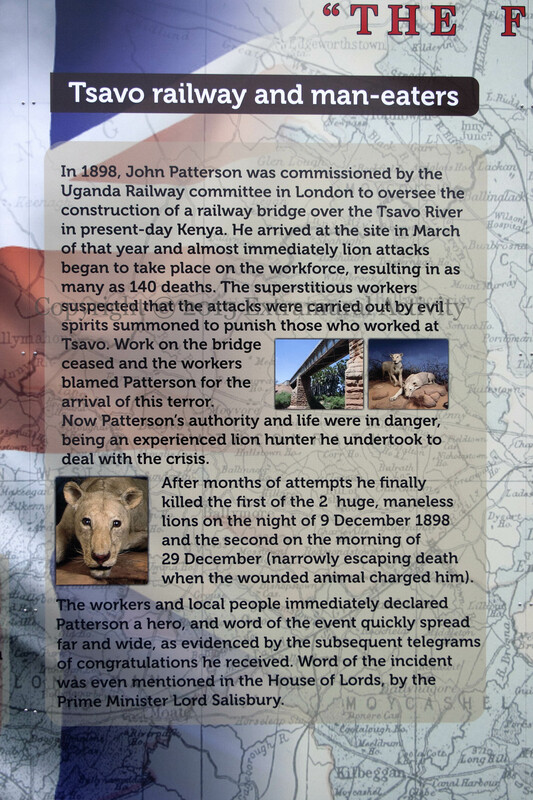 Now Patterson’s authority and life were in danger, being an experienced lion hunter he undertook to deal with the crisis. After months of attempts he finally killed the first of the 2 huge, maneless lions on the night of 9 December 1898 and the second on the morning of 29 December (narrowly escaping death when the wounded animal charged him). The workers and local people immediately declared Patterson a hero, and word of the event quickly spread far and wide, as evidenced by the subsequent telegrams of congratulations he received. Word of the incident was even mentioned in the House of Lords, by the Prime Minister Lord Salisbury. 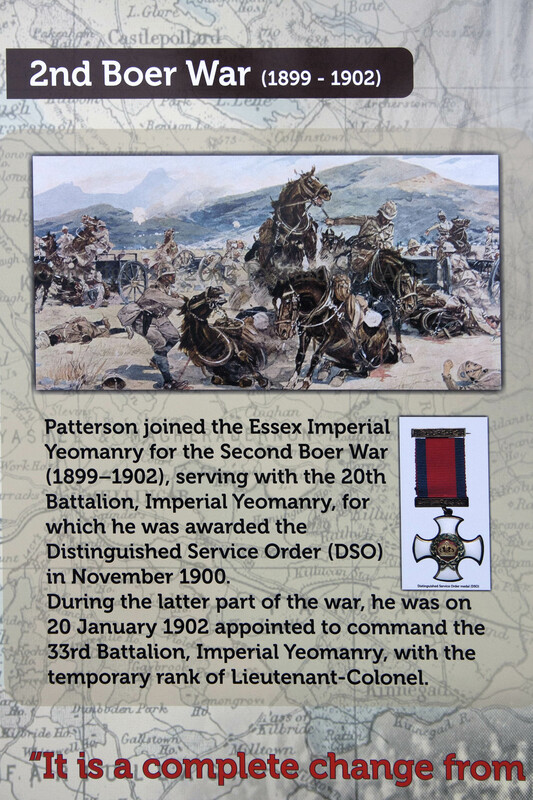 Patterson joined the Essex Imperial Yeomanry for the Second Boer War (1899-1902), serving with the 20th Battalion, Imperial Yeomanry, for which he was awarded the Distinguished Service Order (DSO) in November 1900. During the latter part of the war, he was on 20 January 1902 appointed to command the 33rd Battalion, Imperial Yeomanry, with the temporary rank of Lieutenant-Colonel. Lt. 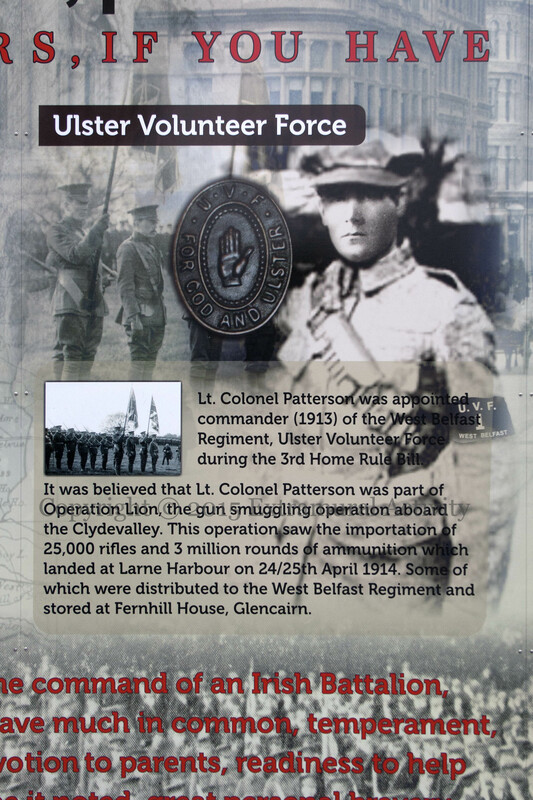 Colonel Patterson was appointed commander (1913) of the West Belfast Regiment, Ulster Volunteer Force during the 3rd Home Rule Bill. It was believed that Lt. 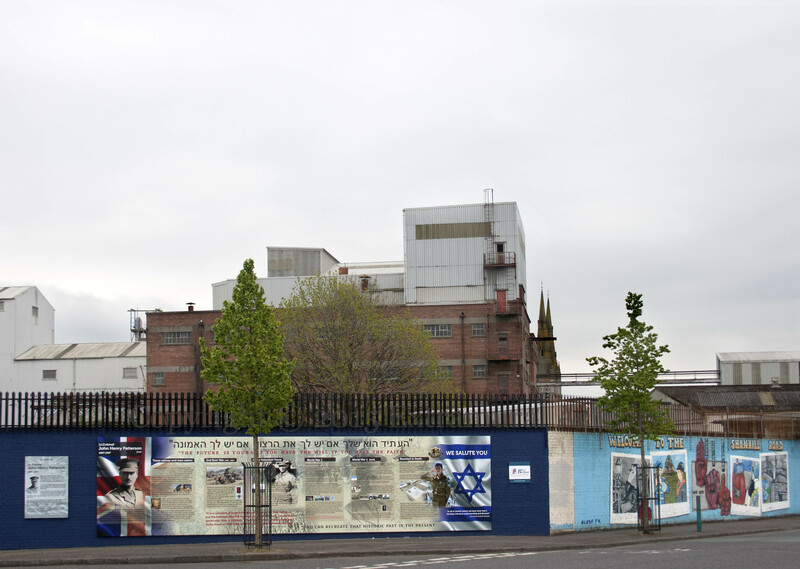 Colonel Patterson was part of Operation Lion, the gun smuggling operation aboard the Clydevalley. This operation saw the importationof 25,000 rifles and 3 million rounds of ammunition which landed at Larne Harbouron 24/25th April 1914. Some of which were distributed to the West Belfast Regiment and stored at Fernhill House, Glencairn. For anyone that’s interested, Westmeath is still Westmeath and not now Longford, they are two dinstinct and separate counties. – Great site!